Plant your feet firmly on the ground with the Robus WF-80 Wide Feet for Vantage Series 3 and 5 Carbon Fiber Tripods, which are compatible with the RC-5558, RC-5570, RC-8860, and RC-8880 models. The replacement 3.2"-wide foot screws into the leg's 3/8"-16 socket, and the swivel joint angles to accommodate the ground. The nonslip rubber provides a tactile hold on smooth surfaces and a firm grip on uneven terrain. 3.2" Wide Feet offer greater traction than standard feet on softer terrain. 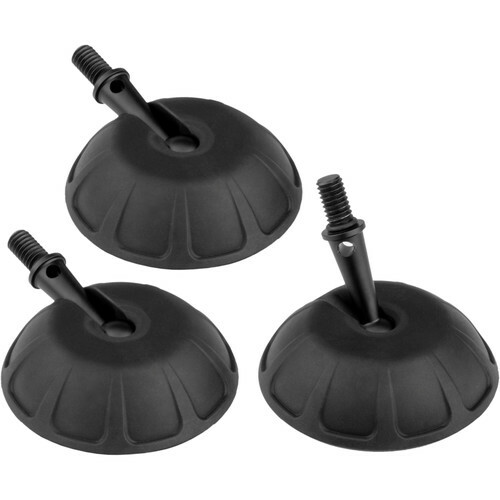 The rubber feet provide a tactile hold on smooth surfaces and a firm grip on uneven terrain. Each foot has a 3/8"-16 thread that screws into the leg quickly, and the swivel joint angles to accommodate uneven ground. Box Dimensions (LxWxH) 4.7 x 4.5 x 4.5"